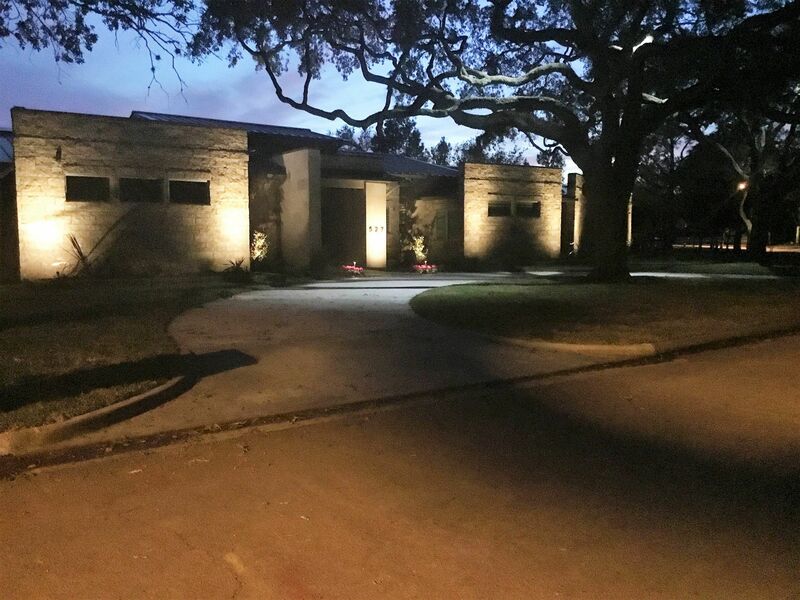 Quality low voltage landscape lighting professionally installed can enhance the landscape and provides many benefits for both residential and commercial applications. 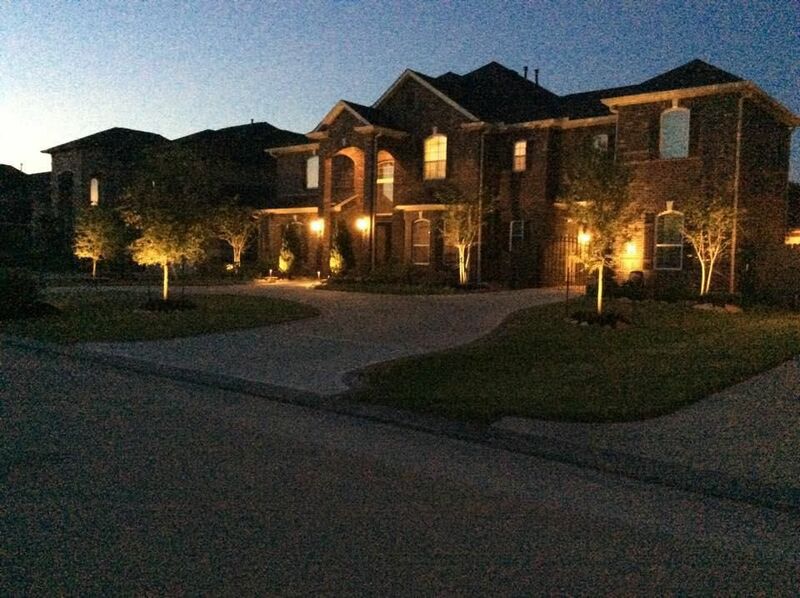 Landscape lighting can add safety, security, ambiance, mood, and drama to the outdoor environment. Limited only to the designers imagination, the practical functions and various mood effects of landscape lighting are endless. Safety - One of the primary functions of exterior lighting is to insure safe passage for pedestrians on steps, sidewalks, walkways or other areas where aspects of the outdoor environment may become a hazard at night. 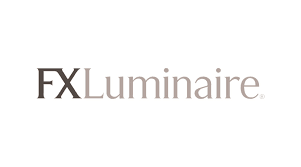 Safety lighting typically projects downward and never into ones eyes and is free from glare. Security - Low levels of light evenly spread around the perimeter of buildings can act as a deterrent to intruders and provide greater security than floods which create pools of light along with dark shadows where someone can hide. Light sources that emit low level light from the knee down silhouette prowlers and make them visible from every angle. Ambiance, Mood, & Drama - Beauty, hospitality and drama are enhanced by the proper selection and placement of landscape lights. Choosing focal points of architecture. art, unique features and landscape plant material can add night time drama to the landscape after the sun has set. 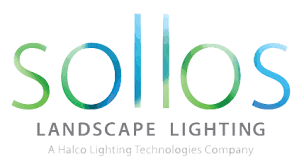 Mirroring the effect of the sun or the moon, down-lighting is the most natural form of landscape lighting. Choose fixtures that can easily be mounted on eaves and walls or suspended from trees and other elevated structures. 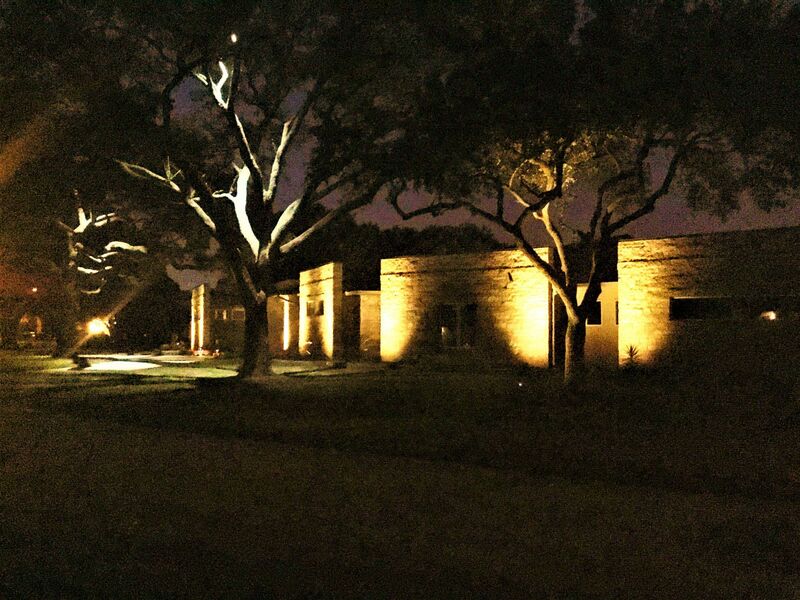 The Down-lighting effect is used to provide general illumination for safety, security or outdoor entertainment or it can be used to focus on a singular object such as a statue or specimen tree. Back lighting illuminates the outdoor area with a backdrop of light that subtly extends the landscape's visual depth for nighttime enjoyment and elegant beauty. It incorporates very subtle wash- lighting of backgrounds such as walls, fences, trellises or other vertical objects. Well lights and Soft Floods are excellent fixtures for back lighting. This effect utilizes a narrowly focused, intense beam of light to accent or highlight a specific landscape object creating a night time focal point. Up-lighting, down-lighting or any combination can be used to create a spotlighting effect; however, care should be given when spotlighting since it has the potential of ruining the subtle beauty and enhancement of the nightscape if too much light is introduced. Silhouetting is created when the image of a distinctive plant, tree, statue or other landscape object is reflected against a wall or other vertical surface. Place lights behind the plant material or object to and direct the light upward onto the backdrop to create this dramatic effect. Choose well lights or spot lights with wide lamp beam spreads. Underwater lighting highlights underwater plant material and captures light to show off depth or imaginative design. Cascading fountains and falls reflect light in their movement adding a visual perspective to the sound of rippling or spraying water. This technique is used to make smaller landscape objects appear larger. Perspective lighting emphasizes a line of sight - similar to a corridor - through plants or a grove. By dimly lighting the foreground with a row of low-level recessed lights along the line of sight and brightly lighting the focal point at the end of the sight line. it creates an illusion that the end of the landscape is further away than it is. Up-lighting means to light something from below. Up-lighting is rarely seen in nature yet this effect is typically used to highlight the internal structure of plant material, to produce large shadows and dramatic facades or to "wash" walls with light. Moonlighting replicates the effects of the moon and is a form of down-light. By suspending or mounting fixtures in large trees, soft diffused lighting of the moon is simulated. The light filters through the branches producing attractive patterns and complex shadows. This technique is used primarily for safety to highlight sidewalks, drives, or any path to ensure safe pedestrian passage at night. Choose pathway lights offering down lighting with emphasis placed on fixtures that incorporate diffused or shielded lamps. Avoid lighting that shines in the eyes. 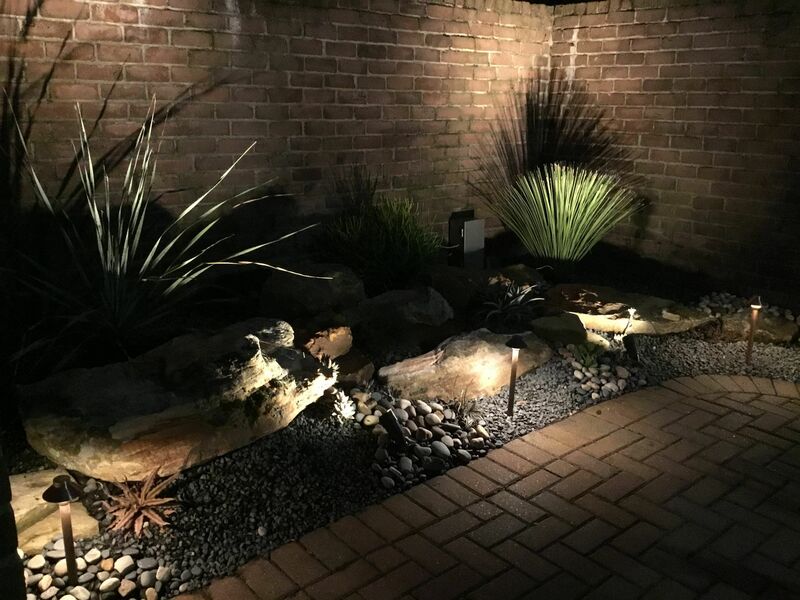 Since path light fixtures become an integral part of the landscape during the day, attention should be paid to placement and daytime appearance. This technique illuminates objects so they are reflected in a dark pool of water. Mirror lighting is accomplished without the use of underwater lights and is typically achieved with the use of down-light fixtures. It is especially effective with dark-bottomed pools and still ponds. 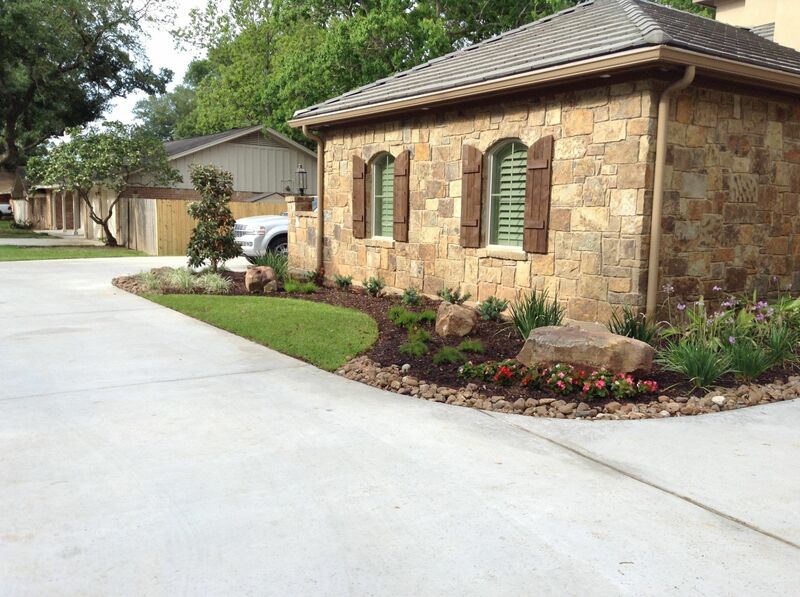 Grazing light is utilized to highlight and enhance the textures of interesting surfaces such as cobblestone, masonry, stucco or tree bark. Hooded fixtures with wide beam spread lamps are ideal for this technique. This effect creates a visual similar to silhouetting, however, the fixture is positioned in front of the plant or object rather than behind it. Since the shadow of the object is often greatly magnified the effect can be more dramatic than silhouetting. This method utilizes two light beams to illuminate a single object in a cries-cross fashion. Cross lighting creates a three-dimensional effect that adds visual interest where a single light source can be flat and boring.